Creating a terraced garden on a steep coastal site in Totland proved a challenge for designer Chris Barnes and landscaper Miles Norris. Clients Mike Oldham and Lesley Forde had lived in the house for several years. "We had done lots of work on the house but the garden was a mess," Mike said. "It sloped so steeply you couldn't see the garden from the house. We wanted terraces that could be appreciated from the house and from the bottom of the garden. We got in touch with Chris and really liked her thinking and her ideas." Chris's brief was to improve the upper terrace and create planting bays to soften the area. She was asked to create a lower terrace for sitting out. The planting was to reflect the coastal site and to look good from above and below. Once Chris's design was complete, Miles took on the landscaping work. 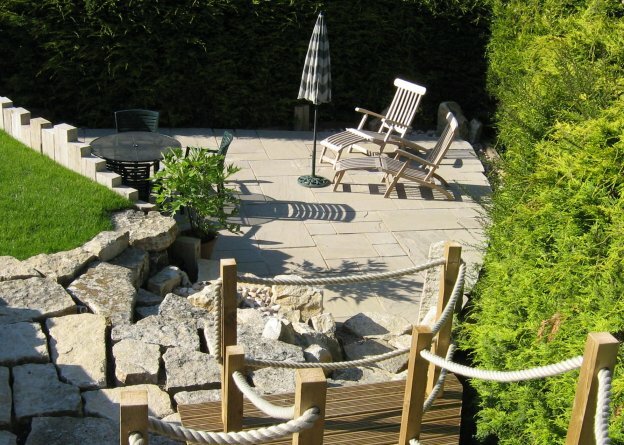 His company is MJN Services and he regularly collaborates with Chris on garden makeovers. Miles explained: "The steepness meant stabilising the terraces was a mammoth task, taking several months. We built foundations from hollow concrete blocks, filled with concrete and reinforced with steel. There was a lot of stone on the site and Chris designed a scree slope using these boulders. 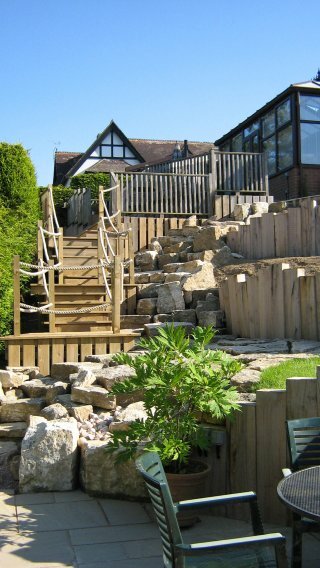 Elsewhere we used a tapestry of materials, oak sleepers, sandstone paving, wooden decking and paths of terracotta chippings framed with sleepers, said Miles. Once the hard landscaping was in place, Chris planted the borders with tough, attractive plants. She explained: "It was important the borders worked together so the separate terraces had waves of the same planting. This makes the garden very easy on the eye, with pools of colour, texture and foliage interest working across the space." "I chose plants to cascade over the retaining walls, prostrate rosemary, anthemis, osteospermums, alchemilla and hardy geraniums. To give substance to the borders I used phormiums with their striking leaves, cistus, pittosporum and hebes. Agapanthus will add height in summer, as will dierama ( angel's fishing rod). Grasses and gaura, sedum and verbena bonarienis will give ripples of movement and attract bees and butterflies to the garden." My goal was to create a garden which was high on wow factor but low on maintenance, looking good from every angle, all year round but particularly colourful in summer," said Chris. Mike said: "Between them, Chris and Miles have transformed the garden from an eyesore into a stunning area that enhances the property."